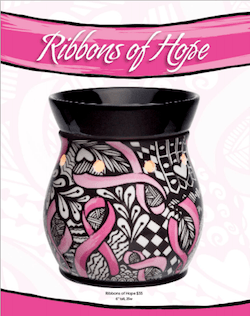 Scenty’s Fall/Winter cause centerpiece: their first cause product back by popular demand called Ribbons of Hope benefitting the National Breast Cancer Foundation in the U.S.
Scentsy is an emerging leader of the direct-sales landscape. With nearly 200,000 independent consultants selling candle-warmers and other home fragrance products via a party-based model, the company has partnered with nonprofits to create cause-branded products since 2010 to raise over $3.2m for charity, drive sales and unify their sales force. 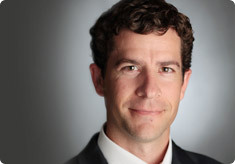 Scenty’s core values are authenticity, simplicity and generosity. The final value espouses “giving more than you take” and their biannual cause products were created as a way to unify consultants to rally behind a cause. One of Scenty’s biggest sales tools is their printed catalog. When cause products are released, they’re featured in the centerfold to ensure prominent placement and consultant participation. This placement has paid off: cause products are very often the season’s best sellers. 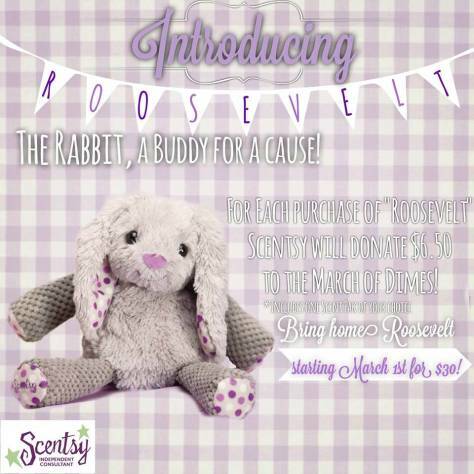 Roosevelt the Rabbit (partner March of Dimes) was so popular it sold out and had to be reordered to meet demand. Scentsy has learned that their best-selling candle warmers are those that incorporate a beautiful design as well as benefit a cause. Early in their cause journey, they created a warmer benefitting a children’s charity featuring a child-focused design, suitable for a child’s bathroom. It didn’t sell nearly as well as those warmers that could be put in any room of the house with a more subtle cause design. Because children are important the brand, they developed a plush “buddy” product that holds fragrance packets. Now when they partner with children-focused charities such as current partner March of Dimes, the buddy cause product is naturally child-centric. Part of Scentsy’s success has been in empowering women to easily own their own business. In a sales model that involves signing up others in a “downline”, there can be an inclination toward competition. The cause product lines allows the entire field to rally behind a cause and encourages consultants to share best practices. Consultants also advance in rank within the company by participating in selling the cause product line. Take a page from the Scentsy playbook: make cause your centerfold, tailor products to more closely match your cause partners and use cause to unite competitors.